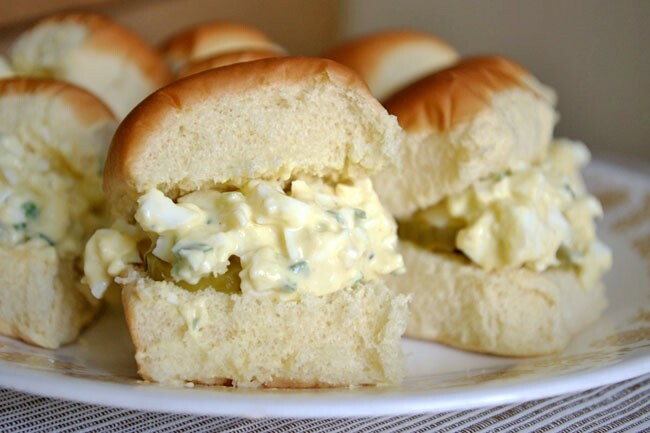 Egg salad doesn't have to be a guilty pleasure. Most egg salad recipes include gobs of unhealthy mayonnaise, but I've discovered that any egg salad can easily get a healthy makeover. The trick is to substitute the mayo with Greek yogurt. Greek yogurt is the perfect sub because it is low-fat, yet the consistency is similar to mayo  thick and creamy. Don't worry about your salad possibly tasting tart from the yogurt  the flavor of Greek yogurt is subtle and the it isn't noticeable at all in the recipe. I calculated the calories in the egg salad and it's about 37 calories per serving (recipe makes 15 servings). Add 55 calories for the roll, and a mini sandwich comes in at 92 calories. They're so cute, you might just up end popping five at once though. 1. Place egg in a saucepan and cover with cold water. Bring water to a boil and immediately remove from heat. Cover and let eggs stand in hot water for 10 to 12 minutes. Remove from hot water, cool and peel. For faster cooling, place the eggs in an ice bath before peeling. 2. In a medium bowl, stir together the yogurt, Dijon mustard, yellow mustard, and green onions. Add a squeeze of lemon juice. Chop the eggs into big chunks and mix gently with the dressing. Season with salt and pepper. 3. Split rolls in half, place two pickle chips in each, top with a scoop of egg salad. Serve immediately or chill until ready to serve.